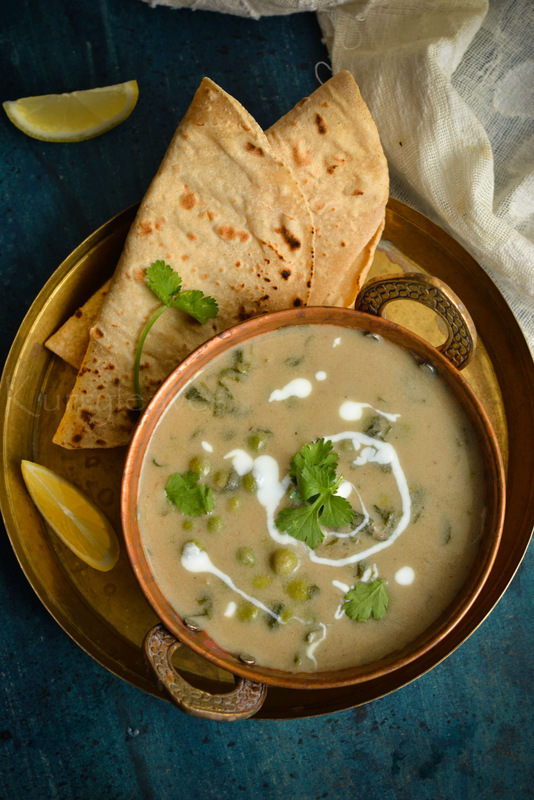 Fresh fenugreek leaves and green peas cooked in a rich ,creamy sauce. Heat oil in a pan,add onion,green chilies,ginger,garlic and cashew nuts.Saute until onion turns golden. Allow this to cool slightly and transfer to a blender.Grind this to form a smooth paste( add 1 or 2 tbsp of warm water if required).Set aside. Heat oil in the same pan ,add cumin seeds and let it splutter.Add the onion mixture and cook,stirring continuously, until oil starts to separate. 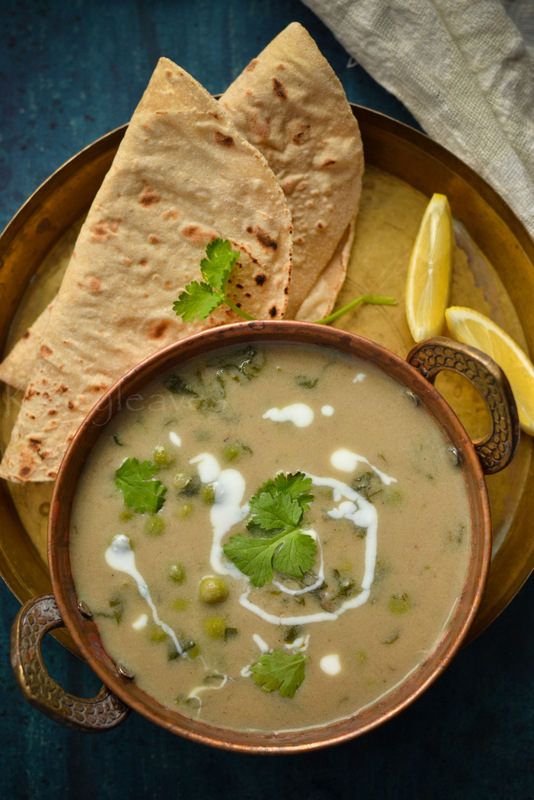 Now add the methi leaves and cook for 2 to 3 minutes.Next add the green peas and hot water(3/4 to 1 cup or as required).Cook for about 5 minutes or until green peas is cooked. Now add garam masala and cream .Simmer for about 4 to 5 minutes over low flame or until gravy turns thick.Finally add salt and mix well.Garnish with coriander leaves.Serve with roti /chapathi . You could also use cashew cream instead of fresh cream. 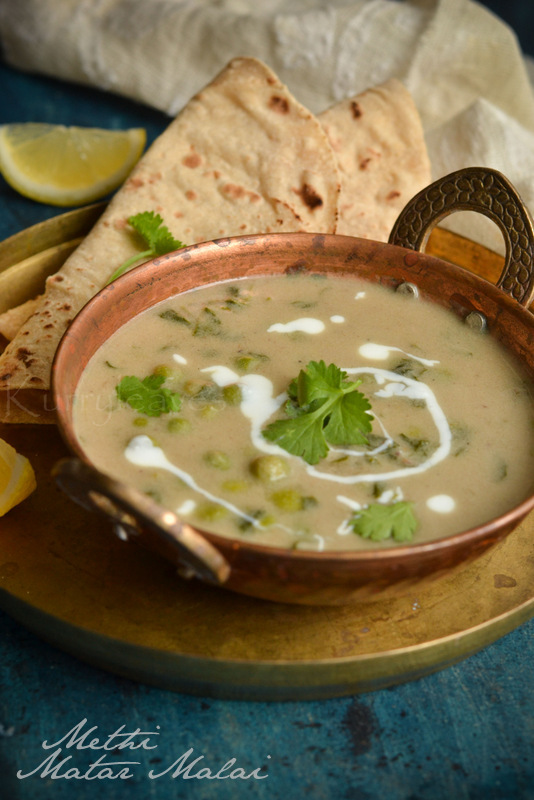 If you prefer to use fresh green peas,cook the peas before adding to the gravy.